Suzanne Wouk, an alumni of the Founder Institute Silicon Valley chapter, is the co-founder of SellHound, the first price comparison engine for easily listing offers across multiple secondhand marketplaces. 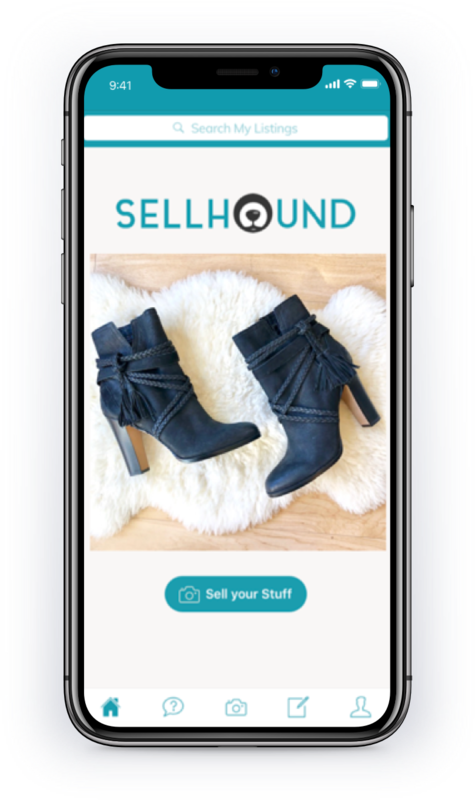 Now, SellHound is preparing to releasing its mobile app, which will allow users to create postings that let them sell used items competitively across multiple resale marketplaces, all by simply snapping a few pictures: no research, writing, or pricing required. The seller uploads a few photos, and that’s it - the app does the rest, including identifying the item, creating optimized listings for the item across multiple marketplaces, and providing a suggested competitive sale price. The biggest pain point in selling online is creating the post. Today, each person carries an average of 50 items wherever they go, most women only wear 20% of the clothes in their closet, and there are 300,000 items in the average American home. However, over the past decade there has been a shift trickling up from younger generations. Instead of toting around Mary Poppins' Carpet Bag, minimalist living is the new "ultra chic.” Compound that with the sharing economy and the idea of “why would I buy that when I could share or rent it?” and you have a future with less stuff. Trends show that Millenials are less tied to their material belongings, and instead value fewer items of higher quality, as well as travel and experiences over tangible things. Baby Boomers and older generations are passing their stuff down, but no one is there to take it. All of this stuff is now just lying around with no real place to go. Wouk thought that technology should be part of the solution. We’ve Got Stuff, but Selling Stuff is Hard. Some of our stuff we love, some of it we tolerate, and some we need to get rid of completely. Our garages are full, and our closets are exploding. How do we get rid of our stuff? We can donate, we can have a yard sale, we can give it away to a friend, try to sell it online, or throw it away. But when everyone is trying to downsize at once, we are left with a surplus. What is my item worth? Where should I sell it? How good do the photos need to be? How do I write a good description? Accorind to Wouk, the biggest barrier to selling used items online is simply the number of different steps associated with creating marketplace listings. Dumb Stuff Needs Smart Tech, Too. New stuff typically has a built-in identity, such as an ISBN or electronic identifier associated with it. But consumers are very accustomed to trading their hard-earned cash for new items, and then quickly ripping off the tag or packaging, rendering new items “used” almost immediately. Often we will only use that item for a little while, or worse, we don’t even use it at all - but by then, it’s already too late to preserve the product’s otherwise perceived newness. Technology today is still catching up in dealing with the problem of used stuff. Yes, there are a multitude of apps and marketplaces for selling used items - but the choices are almost too wide for many - users have to learn how to differentiate between and navigate each marketplace, and still go through the entire process outlined earlier of deciding what to include in a listing. Wouk thought that a better solution might begin with the ability to easily re-introduce secondhand items back into the economy, through building a technology solution that identifies used items in order give them a second life. Once an item is identified, it can much more easily be sold for money, donated by matching it up with a person or organization who needs it, or disposed of properly (especially if it contains toxic elements) rather than dumped in a landfill. Not only is stuff bogging us down, but it is unsustainable to use resources to design and manufacture items that quickly end up back in the landfill, or polluting environments around the world. My ethos is to recycle, re-use or re-sell whenever we can in order to be as responsible as possible with the resources we have. The difference between a lightly-used item finding a second life with a new owner, versus ending up rotting in a landful, is simply the barrier of time associated with navigating the multi-step processes of secondhand or resale marketplaces: SellHound is the long overdue solution. In 2012 I founded SnapPost, an eBay selling app where we successfully listed 30,000 items for sellers and enjoyed a rabidly enthusiastic user base. SnapPost was acquired, and the entity that acquired it eventually shut it down. I have since taken my idea of SnapPost and added lots of technology in order for it to scale. My new company SellHound recently acquired back all the SnapPost assets. I and my team are now finally building the exact product needed by online resellers today. Online resellers and minimalists alike will be watching SellHound in anticipation, awaiting a technology-enabled solution to help kickstart the progression towards the Circular Economy that the world desperately needs. Graduates of the Founder Institute are creating some of the world's fastest growing startups, having raised over $800M in funding, and building products people love across over 180 cities worldwide. See the most recent news from our Grads at FI.co/news, or learn more about their stories at FI.co/journey. Are you ready to join the world's premier startup launch program? Subscribe to our newsletter to receive exclusive startup articles, videos, and more.